Indian Prime Minister Narendra Modi’s government has repeatedly referred to the need for India to “Act East,” and not just “Look East” (the latter policy was the brainchild of former Prime Minister Narasimha Rao). Specifically, Modi has spoken of the need for India to show greater urgency in building trade links, connectivity, and enhanced people-to-people contact with Southeast Asian and East Asian countries. One country the prime minister has referred to repeatedly – even going so far as to call it one of his role models in 2013 – is South Korea, a democratic country that has prospered remarkably. During a speech in 2013, Modi noted that South Korea gained its independence around the same time that India did, and is now counted among the developed nations. During his visit to South Korea in May this year, Modi made no secret of his admiration for the country, particularly in areas like shipbuilding and technology. The prime minister made it a point to visit to the Hyundai shipyards. He also met with a number of Korean executives, including the heads of Hyundai and Samsung, and promised them a better investment climate in India. Apart from economic and strategic issues, one of the important outcomes of the South Korean president’s visit was the announcement of e-visas for South Korean tourists. Meanwhile, South Korea is proposing a visa on arrival for Indian tourists. There has been a steady increase in the number of Indians visiting South Korea and vice-versa. In spite of the goodwill between both countries, there is increasing saturation in the relationship, and bilateral ties are yet to witness a much-needed second big-bang. What needs to be done? The first issue is the investment climate, and it is unfair to blame the central government alone for this. State governments seeking mega projects need to provide a more stable environment; the stalled POSCO deal is a perfect example of the current problems. Still, it is encouraging to see that both the Orissa government and New Delhi are trying to ensure that the project goes ahead. A potential joint venture is being explored with Odisha Mining Corporation. It is also encouraging to see that, apart from states like Tamil Nadu, Maharashtra and Gujarat, even states like Punjab are seeking investment from South Korea. With some innovative thinking, India can take advantage of Korea’s strategic location and explore greater complementarities in the manufacturing value chain, to the benefit of its trade with Japan and China. 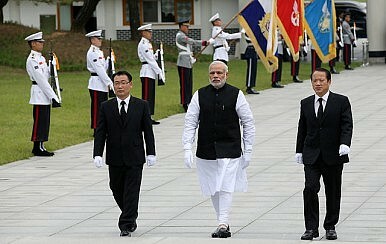 In return, Korea can use India as a conduit to the Middle East. While the two countries have signed a number of agreements in recent years, in areas like tourism, joint research, it is important to ensure that the bilateral relationship moves beyond economics into exchanges in areas such as education, tourism, and joint research. Recent meetings have emphasized all these three sectors, but more needs to be done. Tridivesh Singh Maini is a Senior Research Associate with The Jindal School of International Affairs, OP Jindal Global University, Sonepat. The views expressed here are personal.